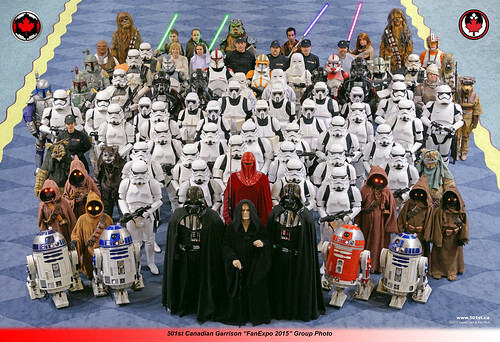 Here is a page featuring all the 501st Group photos I have taken over the years. Starting in 2001 with a Nikon SLR film camera, to photos I take today with a Nikon DSLR. Some of these photos I was the designated official photographer. For some I was not and took a "rogue-shot" for my own interest. Ken Rice does a bulk of the photo touch-ups. Jordan, a former GML of our Garrison, did the layouts for the later photos. For all the images below, click on the image, and you will be taken to the photo on Flickr. From there you can download the full-rez image. Please do not copy and repost the images, use the sharing options on Flickr. I think I was the official photographer for this photo. No plan and no layout done. I'm surprised it worked. I had a film camera at the time since digital was still in its infancy. I followed the rule-of-thumb of using a prime lens, set the f‑stop to f/8, and used a low speed positive film. The result was scanned in with a Nikon LS‑30 film scanner, and touched up by Ken Rice. This was taken outdoors in bright sun. 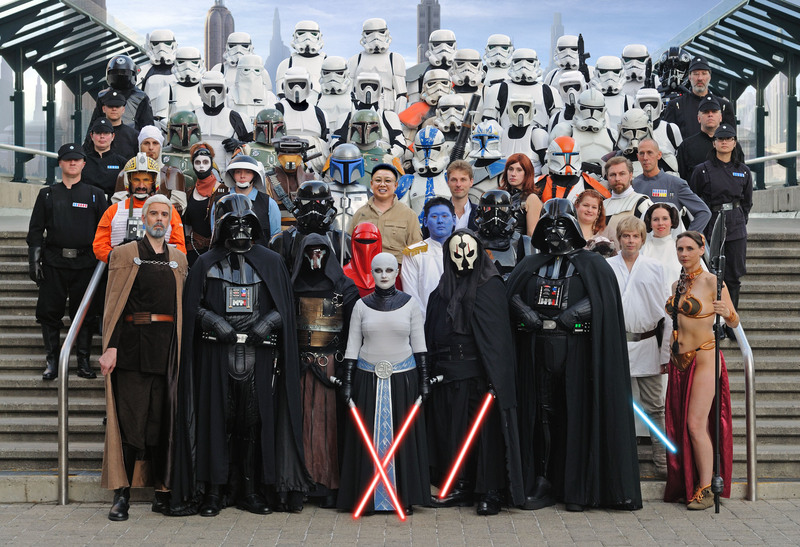 The official photo, but a spontaneous group photo. 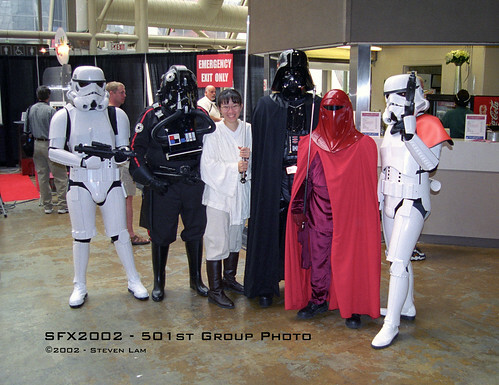 Back in 2002, the convention going members of the Canadian Garrison were literally a handful of friends. Film camera was still the choice at the time, and I just used ISO 400 negative film. The image was scanned with a Nikon Coolscan 5000 ED film scanner. This was taken indoors, in a large windowed area under shaded sun. 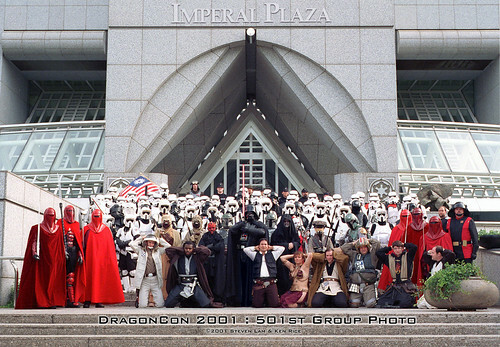 I was the official photographer for the DragonCon 2003 group photo. To get a height advantage, I stood on a stone bollard, but it was off to the side a bit. There were a lot of people, and some got confused and their line of sight is off to my left. I also have vague memories that two people actually passed out while we set up for the photo due to the heat and humidity of Atlanta in the summer. There was no layout plan. Scanned in with a Nikon LS‑30 film scanner, and touched up by Ken Rice. This was taken outdoors in bright sun. 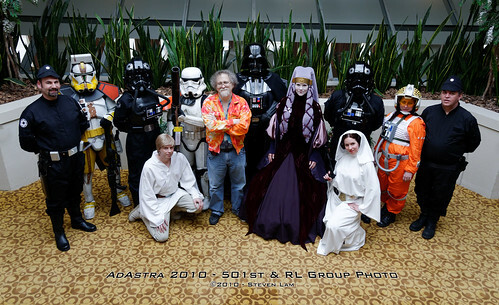 I got more complaints than thanks after I took the photo, so I decided not volunteer for future group photos at DragonCon. 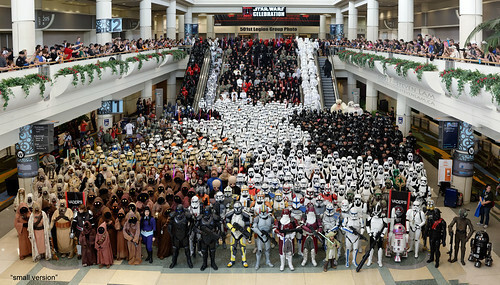 This official photo wasn't planned, but the group and crowds were small enough that there wasn't much need to do so. 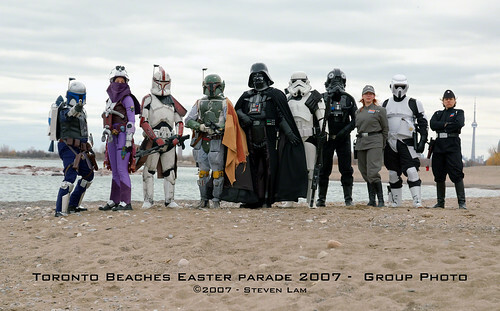 This was also the first group photo I shot digitally. It was taken indoors; next to a sunny window. My rouge-shot since I wasn't the official photographer. I used a 'travel zoom' to take the photo, which had some dominant lens softness on the right hand size of the photo. I'm still curious to see the official photo. It was taken outdoors, in slightly shaded sun. 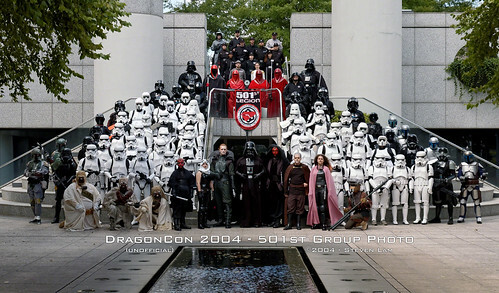 This is my rogue-shot of the 501st group at Celebration 3. I just used my cheap "travel-zoom". I also started noticing the Nikon D70's colour fidelity wasn't very good under these lighting conditions. The official version of the photo, taken to the left of me, was much better. Taken indoors on a ladder. 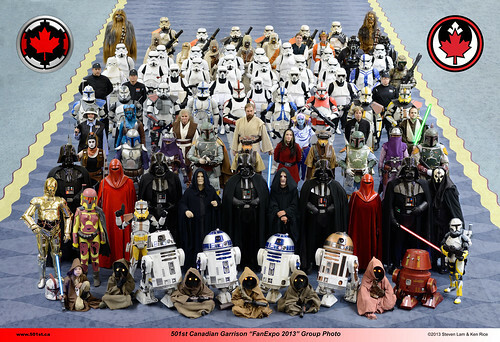 The official photo of just a few of the attendees from the Canadian Garrison. This was another unplanned group photo, and taken with my cheap "travel-zoom" lens. Taking it outdoors on a cloudy day make for perfect conditions since there is less contrast between the shadows and highlights. The official spontaneous group photo taken after the parade. A slightly overcast day makes for perfect lighting conditions with an interesting background. The official photo, but I disown it. This was a planned photo, with a loose sense of the layout. However my camera miscalculated the exposure. I did not chimp the photos, so I didn't realize the photos did not expose correctly. 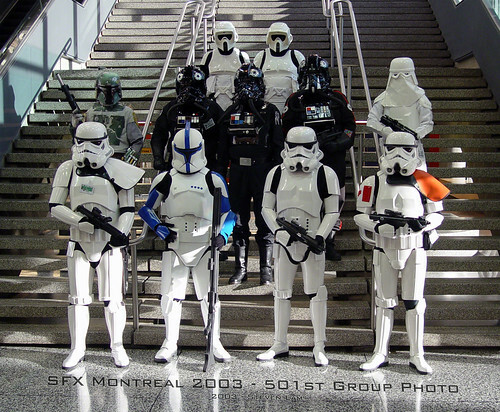 This photo was taken indoors at the Metro Toronto Convention Centre (south building). 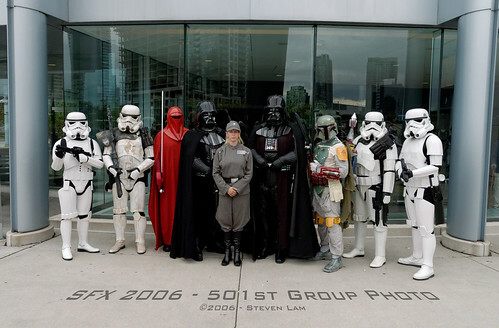 The spot where we usually take the 501st Group photos at FanExpo and Toronto Comicon. It's a nice bridge one level up that looks over the area. I later figured out the exposure metering in the camera got messed up by the flicker in the lights. This was a terrible quality shot. The official photo but completely unplanned group shot. 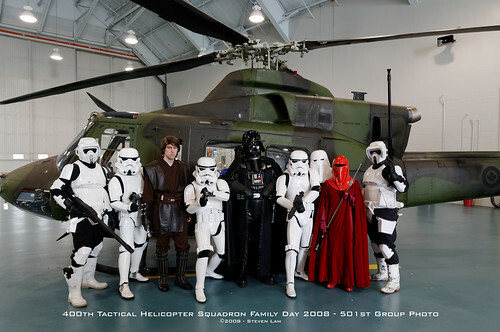 We were invited by the RCAF 400th Tactical Helicopter Squadron to entertain the kids on their Friends & Family day. This made for a nice photo next to one of their helicopters. I had upgraded my camera to a Nikon D300. The photo was taken indoors in a hanger with a lot of shaded sunlight coming in. This is the official photo. If I remember correctly, that year the convention put this on their official schedule. We had a loose idea of the layout. The light levels in the Metro Toronto Convention center are a bit low, so a long exposure was required. Choosing not to use a flash allows for the lightsaber blades to light up their surroundings. Photo touch-ups done by Ken Rice. This is the official photo. Each year, we learn from our mistakes from the previous year, but occasionally run into some new ones. Still just had a loose idea for the layout. The number of people in the group jumped and there was a bit of confusion when people started organizing. Photo touch-ups done by Ken Rice. The official but unplanned group photo. Taken from a set of stairs to get a better vantage point. Large overhead window allowed for indirect sunlight to come in. The official photo was planned with a loose idea of layout. We had to shoot it in a different location that year, and found a set of stairs we could fit everyone. This was taken in indirect sunlight, somewhat shaded. Unfortunately the light was bright enough that the secondary lighting from the lightsaber blades does not show up. Photo touch-ups done by Ken Rice. 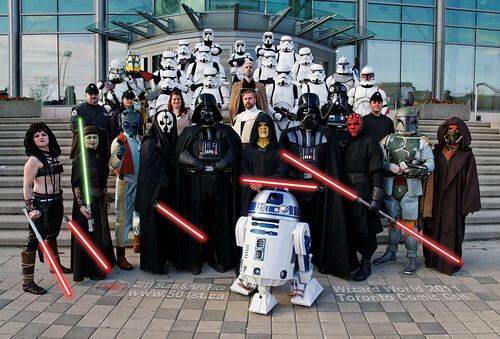 The official photo was unplanned and taken outdoors, which was quite chilly this time of year in Toronto. It was outdoors in direct sun, but shadows were not too harsh. The official, spontenous and unplanned photo, taken outdoors after the parade. Direct sunlight makes for a very contrasty photo. Another spontenous unplanned official photo, taken outdoors. Direct sunlight made for harsh shadows and squinting, but having the sun low on the horizon helped to minimize the size of shadows. The official photo was planned but still with a loose layout. Knocking these things out like waffles! Photo touch-ups done by Ken Rice. Another official photo. 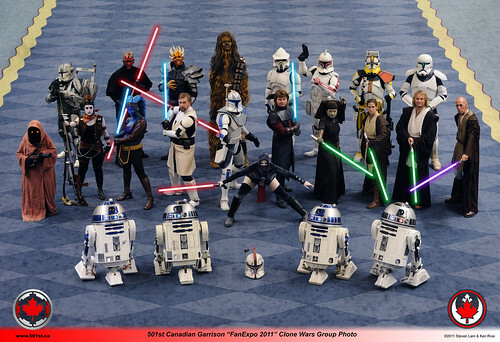 From the same convention as the previous photo, but featuring the costumes form the Clone Wars. This was unplanned, but everyone was there, and no setup changes required. Photo touch-ups done by Ken Rice. 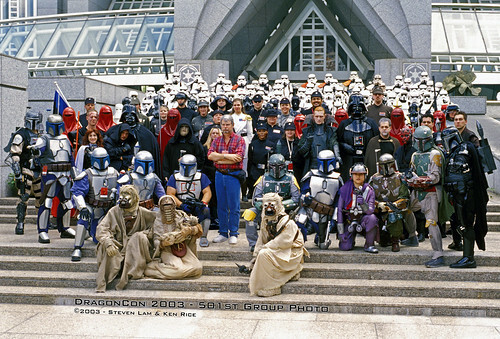 This is my rogue-shot of the Celebration 6 group photo. There was a nice high vantage point 2 levels up on a bridge looking down to the staging area. 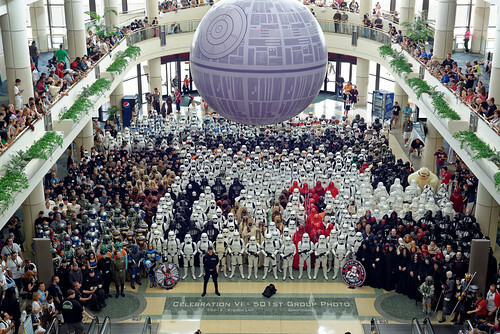 It wasn't my gig, so I could not do anything about the people in the back obscured by the Death Star. Lighting came from the ambient light coming into the convention hall, as well as the windows in back of the photo. Exposure needed to be bumped up since this was essentially partially backlit. The backlighting causing a bit of haze on the people in the back row. A bit of post-processing cleaned up that problem. I also upgraded to a Nikon D800, this was the first group photo I took with that camera. 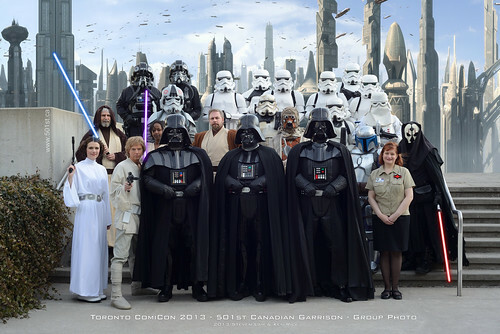 The official photo for Toronto Comicon photo was taken outdoors in indirect sunlight. I also bought a Nikkor 85mm f/1.8G AF prime lens, which produced amazingly sharp images. However, a year or two later I sold it off since I found the fixed focal length limiting. Photo touchups by Ken Rice. The official photo, now with better planning! A more defined layout of the photo was done ahead of time. Photo touchups by Ken Rice. 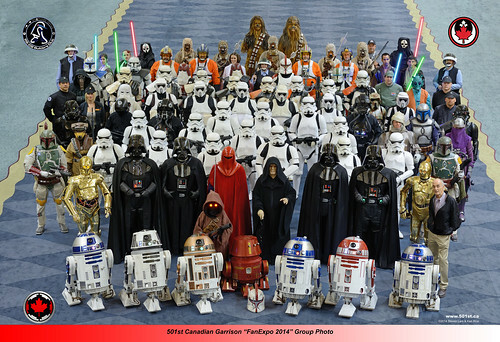 The official photo for the 501st at FanExpo. Considerably more planning and a stricter layout. Photo touchups by Ken Rice. This is the official photo. Since I've done the group shot in this spot for years, this was basically the same thing. This is the first group photo I used my Nikkor 70‑200mm f/2.8G IF‑ED AF‑S VR, it was a sharp lens and gave much more flexibility than a prime lens. Photo touch-ups by Ken Rice. This is my rogue-shot of the Celebration (7) Anaheim group photo. It is a composite of two images to give a wider image while minimizing the pushing-back effect using a wide angle lens would cause. Since the situation was very fluid, I had to stick with using my travel-zoom. Post processing software was used to mitigate the chromatic aberration on the edges of the photo. This was taken in direct sun. Without any height advantage much of the group is lost behind the people in the front. Don't blame the photographer, this was a lack of planning. 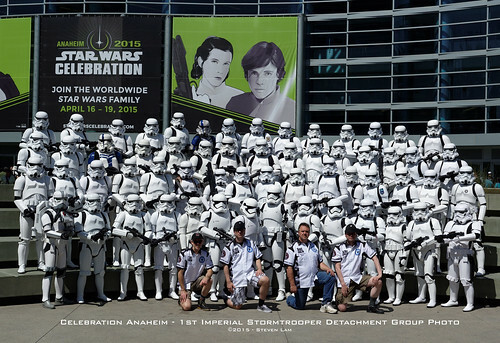 One of the official photos for the FISD at Celebration Anaheim. I was asked to take a series of group photos for the detachment. This was taken in direct bright sun causing some harsh shadows, but over all they turned out great. More sub-detachment photos were taken, check with the FISD for those. For this official photo, we have basically moved to a completely planned shot, with a set layout to minimize the staging and setup time. 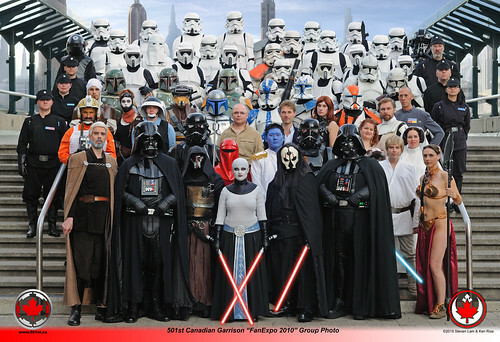 Members had to sign up days prior to the photo and were asked to specify which costume they were planning on wearing so a position could be planned. This got a bit jumbled with last minute changes, the group leans to the top right corner. This is the first time I used the gimbal head on the tripod, and balanced the equipment on site. This helped quite a bit with minimizing vibration. Photo touch-ups by Ken Rice. 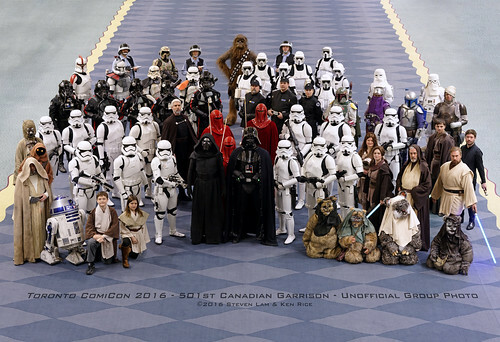 This is my rogue-shot of the Toronto Comicon 2016 group photo. 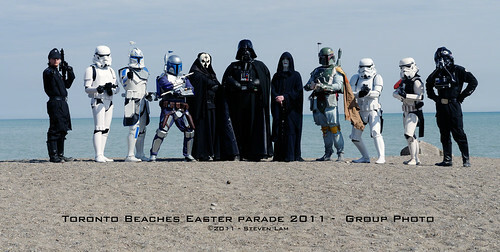 Due to garrison politics, best not retold in public, I was not the official photographer for this photo. Photo touch-ups by Ken Rice. 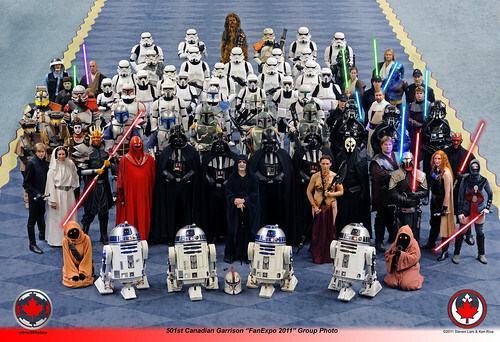 This is my rogue-shot of the Celebration Orlando 2017 501st Legion group photo. 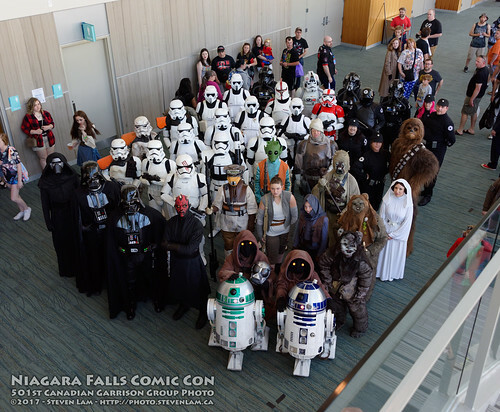 This is my rogue-shot of the Niagara Falls Comicon 2017 group photo. 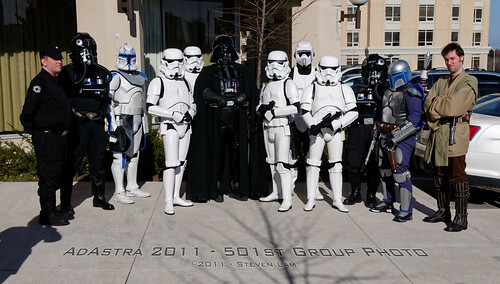 or click here to see non-501st group photos I've taken. 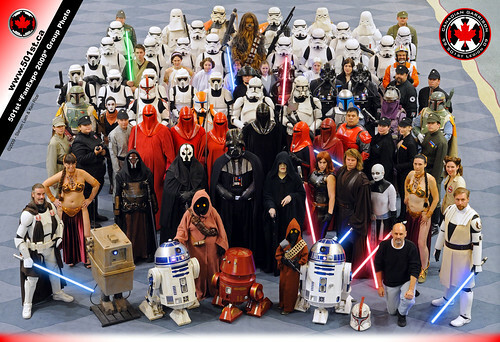 Star Wars, its characters, costumes, and all associated items are the intellectual property of Lucasfilm. © Lucasfilm Ltd.